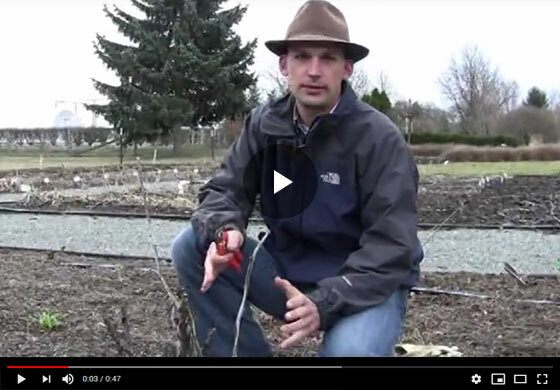 Felix from Gurneys' Seed and Nursery reveals the basics of pruning tree-peonies, explaining how they propagate, and demonstrates how to prune them in the late winter or early spring season. Hi everyone, Felix here with Gurneys. Today we're looking at some tree peonies and what you can run into with tree peonies with their growth habit. Most tree peonies are propagated by grafting or budding onto some kind of under stock, you know, seed grown tree peony variety is typically what's used. Occasionally, you'll see an herbaceous variety used as a root stock for tree peony. What will happen sometimes is you get these initiations, these growth initiations from the under stock, and you can very clearly tell that they're different, this is still a tree peony in this case, but the wood is very different and most the time you're just going to get a white simple flower and then the variety that was grafted is probably going to be more ornate, but it's certainly going to be the variety that you want to grow, and unless you enjoy having two different tree peony peonies to grow, generally the practice is to trim these off and right now, late winter is a good time to do that. We're just going to trim off these rootstock shoots and if you can get it a little bit below grade, below the ground, that's better, and just so happen...this stuff had winter kill, and we have right here, what are most likely shoots from this variety, our grafted variety, but this one here is a shoot that's coming again from the rootstock, so we can trim that off. The way to really know that is if there's some callus formation here and that's when you have that root stock varietal, inner change the separation area, you'll sometimes get tissue buildup depending on the variety, and so you can generally use that as a guide. Wherever you have all this buildup of calcium deposits or mineral deposits, or whatever is happening here, callous buildup, that's how you can tell, if the shoot is coming off of that, you're pretty sure it's a variety. The other thing we want to do here is just trim off a little bit of tissue that's obviously winter killed to make some nice flush cuts there so disease can't infiltrate and then you know if this had a lot of density to it, we might want to open up a little bit, but I really don't have any complaints with the density on this particular tree peony plant. Just some quick points there about what you might see coming out of the ground, what's happening and then how to handle it.